Due to the success of an Army inspection program, the average shelf life for missile systems has been extended from 7.9 to 22.6 years. Here, an Air Defense Artillery Patriot missile blazes forth from a remote launch site at McGregor Range, New Mexico, Dec. 8, 2014. As consumers, many of our items contain a “use by” or “best before” date. In the aviation and missile community, the same principle applies to its weaponry arsenal. 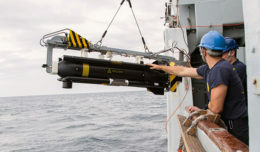 The U.S. Army Aviation and Missile Research, Development and Engineering Center, or AMRDEC [Redstone Arsenal, Ala.], in conjunction with Program Executive Office Missiles and Space, or PEO MS, and U.S. Army Aviation and Missile Life Cycle Management Command, has designed a program to determine if missiles can be used past their initial shelf life. AMRDEC, one of six U.S. Army Research, Development, and Engineering Command centers, executes this program within its Engineering Directorate. 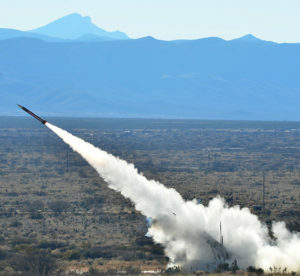 The SRP is the sole mechanism for assuring the continued safety, reliability, performance and availability of the U.S. Army missile inventory per Army Regulations 702-6 and 740-1. AMRDEC, PEO MS and Army Aviation and Missile Command, or AMCOM, collaborate to plan, execute and manage the SRP for all U.S. Army missile systems. The SRP consists of component testing, flight testing and surveillance to collect data on the tactical stockpile. Additionally, users in the field submit a Missile Firing Data Report for all combat and training firings. These four sources provide an overall inventory analysis. The component test is conducted annually through a statistical sample of missiles. All components are tested to see if they have degraded over time. It provides the best data for predicting continuing performance. Most of the SRP testing is conducted at Redstone Arsenal in partnership with Redstone Test Center, or RTC. The Stockpile Reliability Program Surveillance van houses test equipment that can test the missile’s ability to track and correlate designator laser energy. The flight test fires a statistically-representative sample of the tactical inventory. Flight testing provides an indication on how well the missile performs in various temperatures and environments. It gives the SRP the best snapshot of current reliability. The surveillance program consists of visual inspections and non-destructive testing. Visual inspections of missiles are conducted by a quality assurance specialist for ammunition surveillance for stockpiles worldwide. Some surveillance programs are conducted at depots while others are conducted across portable test equipment that can be deployed worldwide. 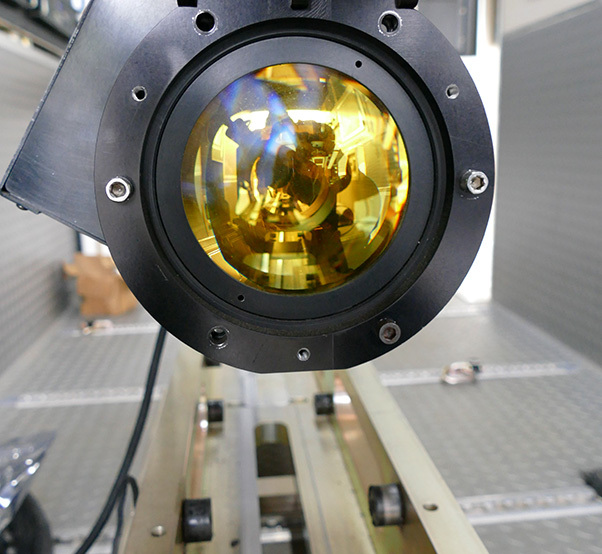 This non-destructive test provides immediate identification and segregation of failing missiles to ensure readiness. 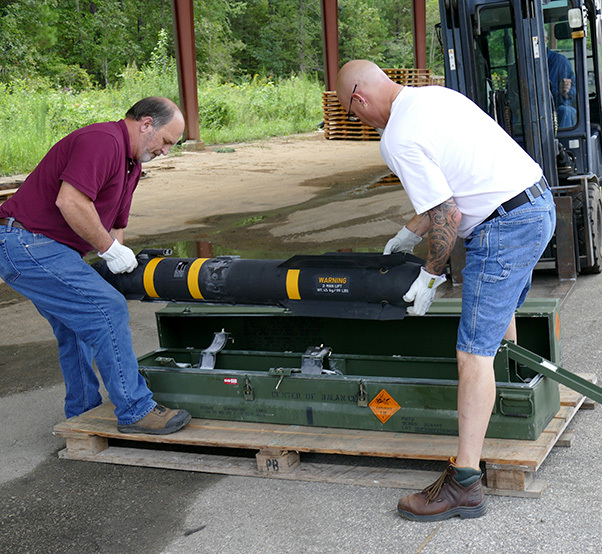 During a Stockpile Reliability Program surveillance mission, Chris Johnson, left, and Lee Hicks, right, both ASRI engineering technicians, return a HELLFIRE missile to a container after testing is complete. Due to the success of the program, the average shelf life for missile systems has been extended from 7.9 to 22.6 years. 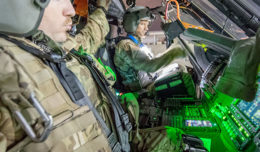 AMRDEC partnered with PEO and AMCOM to provide technical support to foreign military sales customers and the U.S. Navy and U.S. Air Force through its joint SRP and field surveillance programs, or FSP. The FSP and Joint SRP offer a multitude of benefits to the joint servicemen and foreign partners. A joint SRP reduces the quantity of U.S. Army assets destroyed for component and flight test purposes. The partners share in the lessons learned and technology advances to improve missile reliability or maintenance.